Honey Bees, Bumblebees and Wannabees! 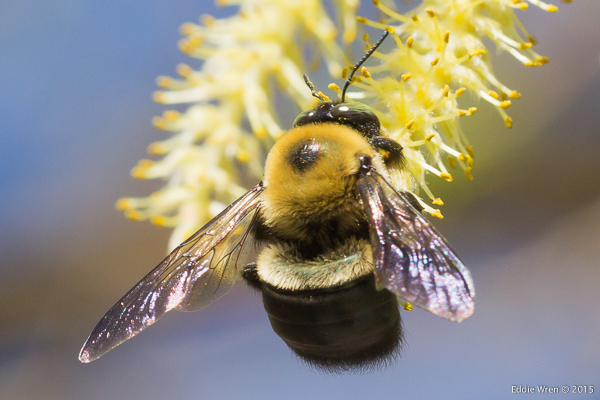 [Another visit to the NYSDEC preserve at the Five Rivers Environmental Education Center at the end of April proved to be an excellent opportunity for watching pollinating insects at work. All of this needs to be considered in light of the fact that there are now major threats facing the survival of bees, worldwide, and heaven help mankind if bees are decimated to the point that crop pollination is badly affected. 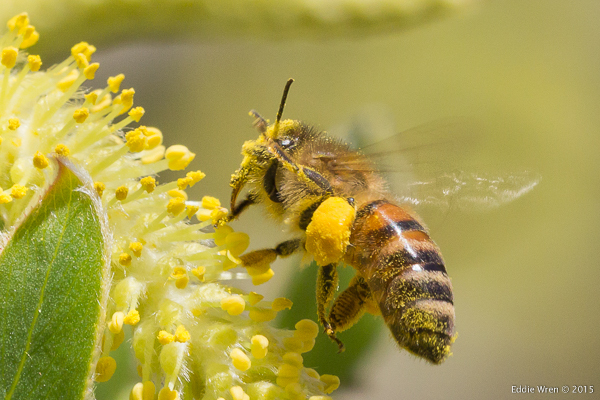 How much more pollen can this Honey Bee carry? 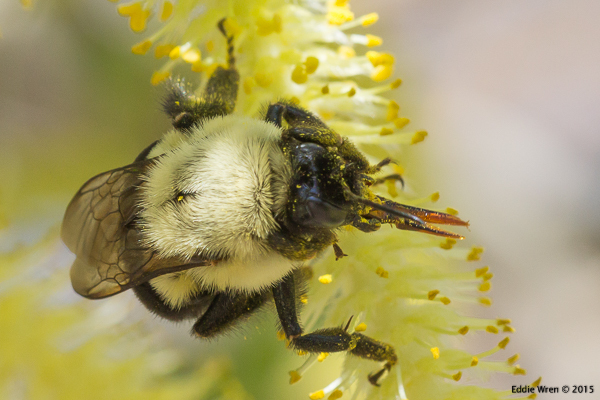 From what I saw, there were apparently two species of bumble bee and one species of honey bee present at the various blossoming willow trees on the Five Rivers’ Beaver Tree Trail but it turns out that individual bumble bee species are very difficult to identify from one another. I learned this after buying an excellent book some months ago, under the title of Bumble Bees of North America (Princeton University Press). In the book, it describes the need to study leg joints and other tiny parts of the anatomy, but as I have enough to do in terms of photographing wildlife and I’m also extremely disinclined to kill something I’ve just enjoyed photographing, merely so I could study its leg joints, this is not something I would do. Having said that, I did take the liberty of sending a couple of my photographs via Twitter to the Xerces Society, (@xerces_society) an organisation that protects wildlife through the conservation of invertebrates and their habitat, to see if they could help me with identification. Note that the name is not spelled ‘Xerxes’ and they have nothing to do with 300 Spartan warriors! The Xerces people kindly referred me to a group called Bumble Bee Watch (@BumbleBeeWatch) and I’m hoping they might be able to help enlighten me. Apart from the bees that were present there were also a few Snowberry Clearwing Hawk Moths (Hemaris diffinis). As their name shows, these rather dramatic and perfectly harmless insects have clear, see-through wings, not the coloured wings that we normally expect of moths. The reason is that their body colouration has been designed by evolution to mimic bumble bees! This gives these otherwise defenceless moths a degree of protection from predators that might otherwise eat them. On previous visits to Five Rivers – and, indeed, on the same Beaver Tree Trail – I have previously photographed a very close cousin of the remarkable Snowberry Clearwing, the Hummingbird Clearwing Moth (Hemaris thysbe) and for both of these species the final surprise for anyone watching them is that they feed by hovering above their chosen flowers, while feeding on the nectar through a very long proboscis. Think of it as like drinking through the equivalent of a ten-foot drinking straw! Anyway, this day’s Snowberry Clearwings were a new species for me, but they weren’t the only one. 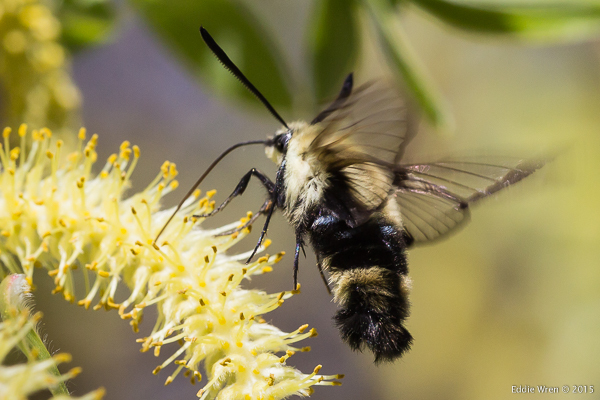 In among the bees and the clearwing moths were also a few bombylid flies. 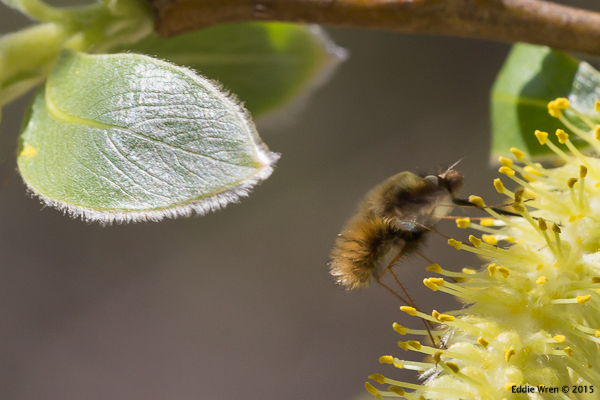 According to my books, they looked most like the species known as Black-tailed Bee Flies (Bombylius major) but as I didn’t actually see any black tails in among them I must assume that they might have been a different but closely related species. They, too, usually hover over flowers while feeding although that’s not the case in the photograph below. However, the larvae of the many species of bee fly either prey upon or parasitise the larvae of other insects, including bees. Also feeding from the male catkins on the wonderful but very elderly willow tree that had triggered this insect feeding frenzy were Mourning Cloak and various white butterflies. 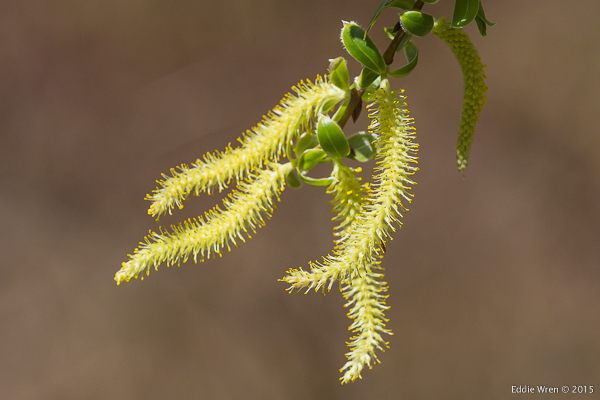 All in all, I spent well over an hour under that willow tree, frankly delighted by the amazing display of its flowers and by the wealth of insect life it had attracted. The air, quite literally, was abuzz with their sounds and as the pesky mosquitos have not yet appeared for the summer, it was uninterrupted enjoyment. Want to see a wonderful wildlife spectacle in spring? Go and stand under a mature, flowering willow tree! There’s probably one not too far from you, particularly on the edge of water courses or other wetlands. This entry was posted in Bees, Book Reviews - Nature, Capital District, Eddie Wren - articles by, Flowers, Insects, Links to Websites, Moths, North America (preserves & reserves), NY State, NYSDEC, Photography - Wildlife & Nature, Plants, Pollination, Symbiotic Relationships, Trees, USA (preserves), Water Bodies and Wetlands, Wildlife - Nature - Natural History.